The AS1135 is a single-chip, highly integrated CMOS solution for Power over Ethernet (PoE) Powered Devices requiring input power of up to 30Watts. Applications include Voice over IP (VoIP) Phones, Wireless LAN Access Point, Security Cameras, WiMax Terminals, Point of Sales Terminals, RFID Readers, Thin Clients and Notebook computers. 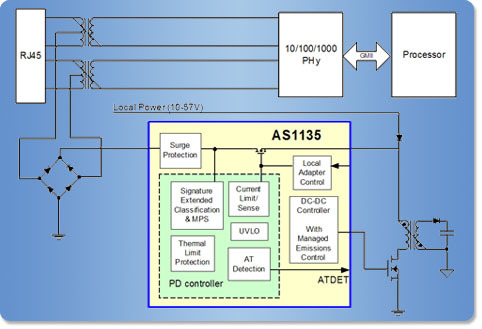 The AS1135 integrates input Surge Protection, a PD controller, and a low-emission DC-DC controller. The AS1135 implements all the physical layer Powered Device (PD) functionality as required by the IEEE® 802.3af-2005 and IEEE® 802.3at (Draft 3.0) standards. This includes 2-event classification, Type2 PSE detection indicator (ATDET) in addition to PD detection, under-voltage lockout, and hot-swap FET integration. The AS1135 has been architected and designed to address both EMI emission concerns and surge/over-voltage protection in POE applications. The AS1135 implements many design features that minimizes transmission of system common-mode noise on to the UTP. On-chip integration of surge protection provides faster ressponse to surge events and limits stray surge current from passing through sensitive circuits, such as the Ethernet PHY device. The device is designed to provide a safe low impedance discharge paths directly back to the earth ground, resulting in superior reliability and circuit protection.